In the summer of 2018, Ronda Rousey approached Oneupweb with a unique challenge. Deep into her new career as a WWE superstar, she had no platform for directly reaching her fans on her terms. For years, the only communication Rousey had with her fans was through the media, but the ESPNs or TMZs of the world weren’t going to be a genuine conduit between Rousey and her fans – they were there to get the story they wanted, for better or worse. This led to more than a year of silence from Rousey, who eschewed media responsibilities for her final UFC fight. After she went silent, millions of people wanted to hear from her, but her trust of the media was broken. 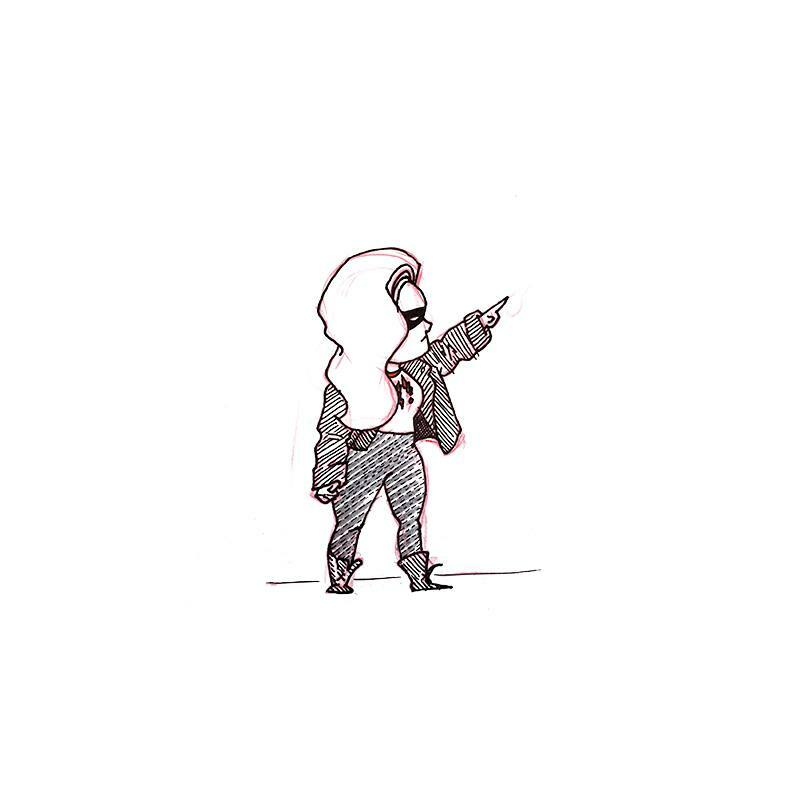 An original sketch created for Ronda Rousey. Rousey eventually decided she wanted to share true-to-life news and interviews directly with her fans. She filmed more than 70 judo lessons she hoped to share as well, with hundreds more to come. Coming from the first woman from the United States to medal in Olympic judo, this was a waiting treasure trove. But she had nowhere to put the articles and videos. And she had no way of organizing her massive piles of content. This led to a plan to build RondaRousey.com, a one-stop shop for everything Ronda Rousey. Months passed. After going through multiple vendors that didn’t really get the “Rowdy” brand, Ronda approached Oneupweb with a deadline: We had six weeks to design her site from the ground up, hitting every facet of her life – a dojo hosting her judo lessons, a wrestling section highlighting her journey through the WWE, a media gallery filled to the brim with exclusive photos and videos, a custom merchandise shop, and a history section documenting her near-decade-long reign on top of the UFC. The most personal part of the site would be a Life section for sharing details about her ranch, Browsey Acres, her movie roles, and her love of gaming. With the tight deadline, our lead designer on the project worked dozens of hours making hundreds of sketches, calligraphic ink illustrations, and hand-rendered moving mockups for mobile. The feeling of the Ronda Rousey brand quickly took shape within digital re-creations, pixel art illustrations, and block carvings and prints in every style, from calligraphy to cartooning to realism. 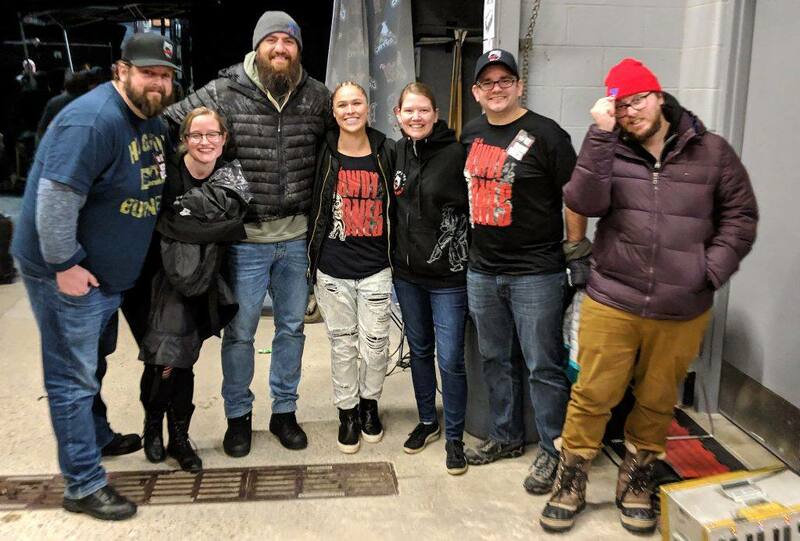 Members of the Oneupweb team meet Ronda Rousey and Travis Browne in Grand Rapids. As design progressed, all hands were on deck to get other aspects of RondaRousey.com up and running as quickly as possible. Long days and nights were dedicated to wireframing, planning user paths, and working through custom development in WordPress and WooCommerce to deliver a unique (and super cool) navigation style. So, we completed the website in record time – a bold, honest representation of an inspiring professional who loves her fans. We continue to enjoy working with Ronda as she walks to the squared circle as the first woman to headline WrestleMania.